Sometimes when you do that from the cricut MB you come across some awesome projects. I think it is time I brought up the creative hands award back up doesn't it? While looking at Sharon's blog , I was so surprised that such a talented person like her has my blog up on her blog list. Well moments like these leave me speechless and also has me reflecting on how far this blog has come along on this gypsy journey. A little bit of frustration in learning the G without any manuals and an idea that maybe logging the learning curve so that it may help others avoid the same pitfalls was what started this blog and when I see things like these and also see the number of followers I have - well since I am only human (though orne'ry old one sometimes) , I feel so touched and my heart does fill with joy! Thank you for all your time working on YOUR blog. If it wasn't for you my G would still be in it's box! ALL you do is greatly appreciated!! That tutu project is adorable. I'll be revisiting that page for sure as both my stepdaughters are in ballet. I think it'd make adorable gifts at competition time! Thanks for taking the time to post them and for all your information on the Gypsy. I can't wait to get one! 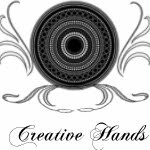 Pam...thank you so much for the Creative Hands award!!! You are such a sweetie!!! I was so excited just hearing that YOU looked at my little blog......to be given your award is just too much!! Thank you...thank you!!!! I bought my Gypsy in Oct and it is still in the box. My old laptop wouldn't hold a wireless signal so I couldn't trust that I would stay online long enough to update and sync everything. I now have a new laptop, Vista 64, and have heard there may be a problem with it & the Gypsy.